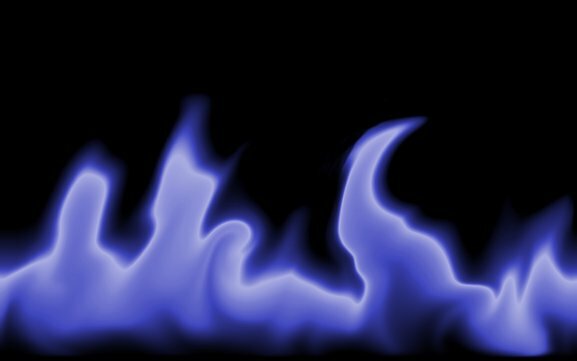 For whatever reason, flames are neat looking. I’ll leave it to psychologists to explain exactly why that is. All I know is that things on fire usually look cooler than things not on fire. To me, that also includes my wallpaper. As regular readers may know, I like to create my own abstract wallpapers and I’m a fan of the Gimp. Today we’re going to use Gimp to create flame wallpaper for your desktop. 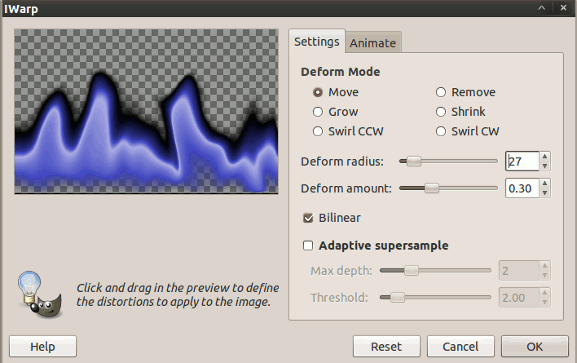 This process will work on any system that can run Gimp (Windows, Linux, OSX) without any additional plugins or textures. You’ll probably want to start with a solid background color. Even if you’re not going to use it in the final product, it helps to have something to contrast the flames. 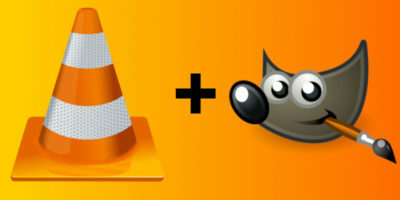 In this example, we’ll be using a black background on a 1440×900 image. 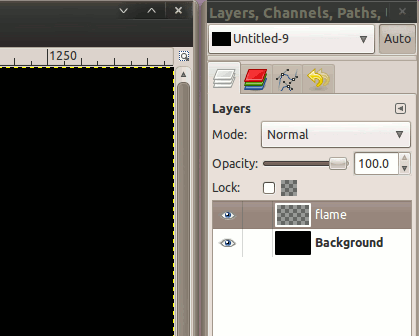 In the Layers dialog, click the “Add New Layer” button. 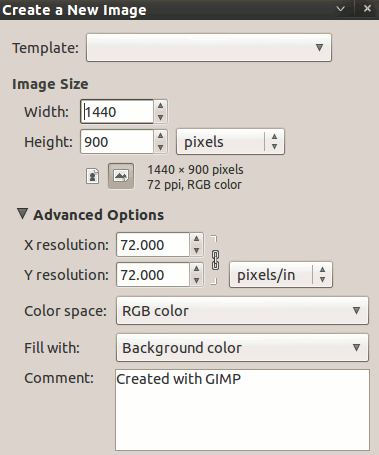 This can also be done by right-clicking the white space and choosing “New Layer“. 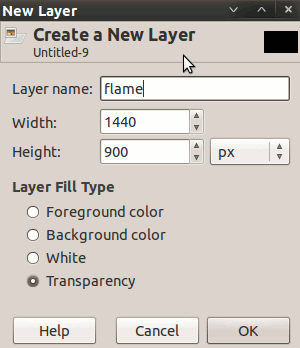 When asked for details, enter “flame” for the name and make sure Layer Fill Type is set to Transparency. 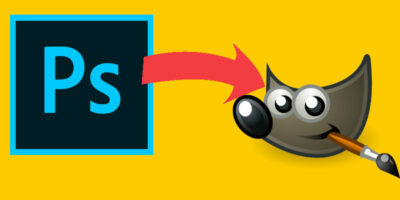 You should now have one solid black Background layer and one transparent Flame layer. We’re going to start with a simple gradient to form the base of our flame. 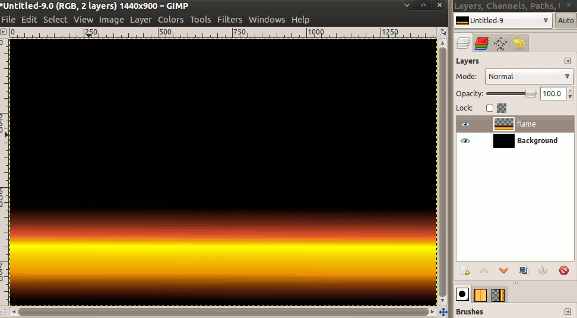 From the toolbox window, choose the Gradient Tool. In the options section, look under Gradient for Burning Transparency. 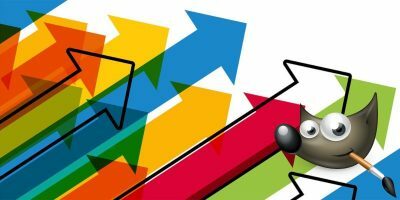 To apply it to the canvas, make sure you’ve got the Flame layer selected and drag the cursor from the top of the canvas to the bottom with the left mouse down. Your canvas should now look something like this. Normal flames are great and all, but if you want some variety, this is a great spot to try messing with the colors a bit. 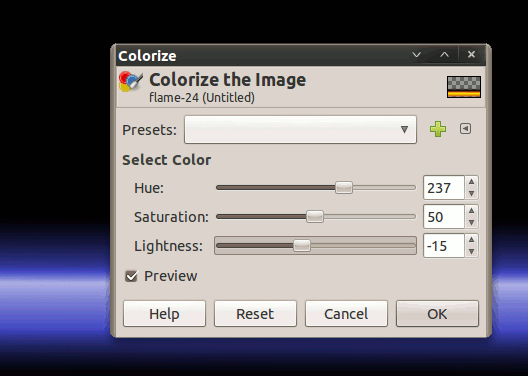 Gimp has a huge variety of color tools for different purposes, but for a quick and simple change of hue, try the Colorize option from the Colors menu. Now we’re ready to create the actual flames. For that, open Filters -> Distorts -> IWarp. We’ll be using a few of the options in this tool, but for starters chose the Move tool and set Deform Radius to 30. 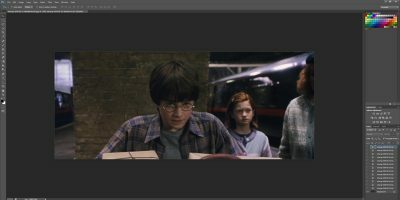 The preview window on the left is interactive, and dragging your mouse in a zigzag pattern across it will warp the image according to your movements. You can now reduce the Deform Radius if you wish, and continue dragging across the preview screen to make finer adjustments to the overall shape. And now to give it a little more spice, we’re going to use a slightly different warp. Instead of the Move option, change the Deform Mode to one of the Swirls (either clockwise or counter clockwise, it makes little difference). Choose a radius you think is appropriate, and drag some swirls across your preview pane to see how it affects the image. After clicking OK, you should see your flame rendered nicely to your canvas. If things aren’t exactly the way you want them, the two tools I’d recommend for touchups are the Eraser tool and the Smudge tool. Use the eraser with a fuzzy circle to smoothly remove portions of your image. It sometimes helps to reduce the opacity of the brush to help prevent sharp edges, even with the fuzzy brush. Smudge makes it easy to add and extend your flames. 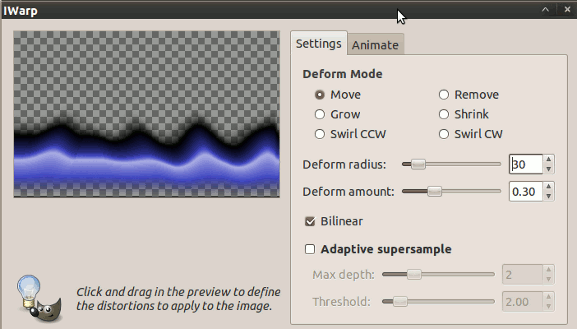 Just drag the mouse across a section of flame much like IWarp’s Move tool.